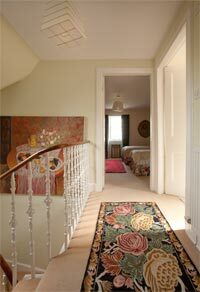 Angela Bell welcomes guests to stay for bed and breakfast at her traditional Victorian farmhouse home on the edge of the small village of Murthly 4 miles south of Dunkeld and about 1/4 hour's drive north of Perth in the valley of the River Tay. 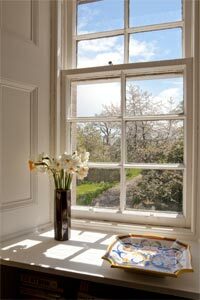 This is a relaxed and comfortable place to stay with a cosy homely atmosphere, and being set in a garden a hundred yards from a little-used estate road, it is quiet and peaceful. There's woodland on one side and fields on the other and distant views to the southern edge of the Grampian Mountains. It's all very rural and quite possibly you might glimpse deer in the shadows among the birch trees at the side of the house as you wake in the morning. There are wonderful walks and cycling from the doorstep. Hidden away in this landscape you can discover ancient standing stones and stone circles and on the other bank of the river the site of one of the most northerly Roman fortresses. Angela is happy to make you a packed lunch for a picnic by the river. 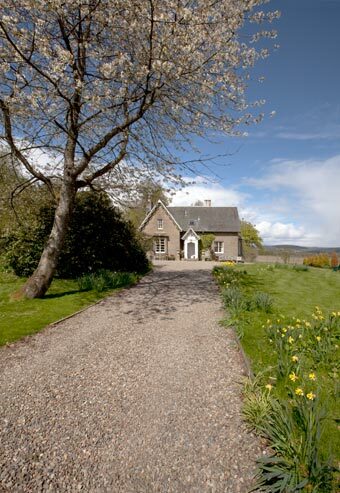 Bradyston Farmhouse is also very central and convenient for touring Scotland, and is just a few minutes off the A9, the main route between Edinburgh and Inverness. It's great for visiting Edinburgh too: You can save parking problems by taking the train from Dunkeld right to the city centre. And Angela is an expert on Edinburgh, so ask her all about it. The two bedrooms are at either end of the landing (right). You can see one of the bedrooms through the door at the end. It has its own private bathroom (bath, shower attachment, basin and wc) next door on the right where the sun lights up the carpet. Twin bedroom with private bathroom next to it. Each bedroom has a hairdryer, tea and coffee-making tray and books and magazines. 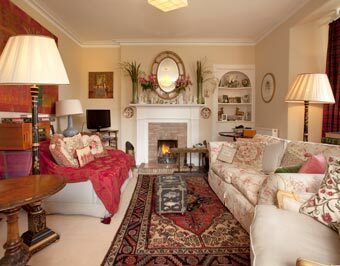 You are very welcome to use the sitting room which has comfortable sofas, a log fire in cool weather and a television. Free Wi-Fi internet access for your laptop or iPad. 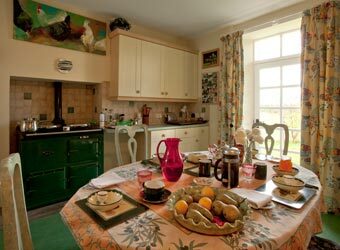 Right; Breakfast is served in the kitchen kept cosy by a green Aga. On warm mornings you are welcome to have breakfast in the garden. Angela uses the best ingredients, mostly local: good bacon and sausages from the excellent local butcher, hens eggs from free-range chickens next door, and the best Black Pudding from Stornoway, as well as porridge and cream, fruit, orange juice, fresh coffee, teas, toast and home-made marmalade. For evening meals there are pubs and a good many places to eat out within a 20 minute drive. Dunkeld, only 4 miles away, has a hotel/pub which specialises in live traditional Scottish music. There's also the very popular Ice Cream Parlour 1.5 miles away. 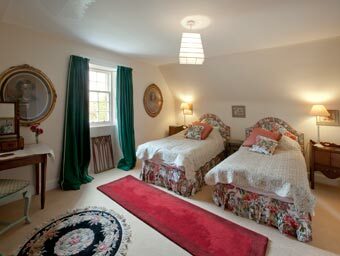 £65 per double room per night including breakfast. 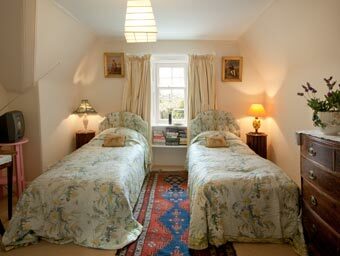 £45 per room per night for a single person in a double room, including breakfast. Angela is very happy to provide picnics - ideal for fishermen for lunch on the riverbank. Please enquire. Also, with advance notice she can make simple suppers, such as omelettes, soufflé, soup and fruit. Please tell Angela you found Bradyston Farmhouse through About Scotland!